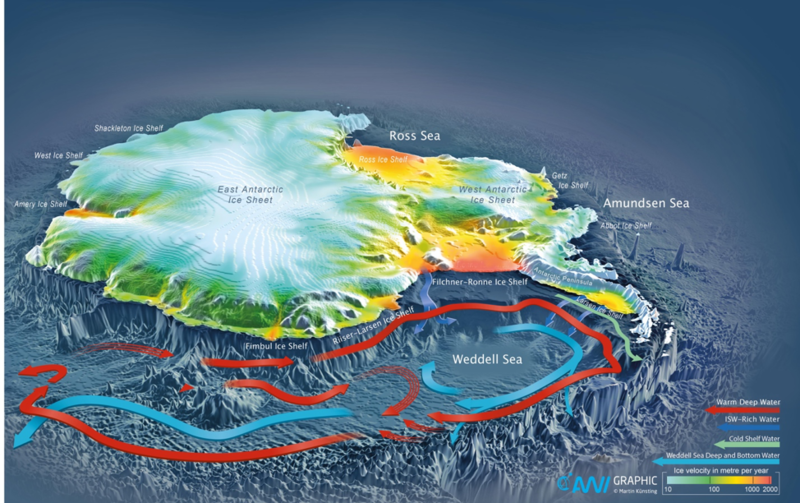 Weddell Sea circulation produces the world’s coldest, freshest and most oxygen-rich bottom water. This water is steered north by the Antarctic Peninsula and escapes the basin through Orkney Passage, South Sandwich Trench and Georgia Basin to replenish the deepest water mass to circulate the world’s abyssal ocean, known as Antarctic Bottom Water. In contrast, Circumpolar Deep Water brings heat south, toward the Antarctic continent, and is cooled in the Weddell Gyre by surface heat loss, sea ice formation, interaction with the Antarctic ice sheet, and mixing with colder water. These processes are strongly affected by wind forcing. Both natural and human-caused changes to the winds influence the characteristics of the Weddell Sea’s unique contribution to Antarctic Bottom Water.